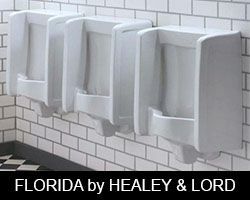 The Healey & Lord range of Florida wall-mounted premium urinals can be found in washrooms across the globe, from Jamie Oliver’s Italian restaurant chain, to the Chifley Tower skyscraper in Sydney, Australia. The classic retro-styled Florida urinal is made from high quality ceramics, and provides a stunning look to any contemporary, art-deco or traditional washroom project. Florida urinals can be purchased individually, or as part of a pre-configured pack with up to 5 stations that contains urinals, flushing systems, sparge pipes, inlets and wastes. We offer Florida urinal packs with infrared sensor controls, available with either direct flushing or more traditional indirect piped systems with cisterns for concealed or exposed pipework. Please note, as Florida urinals are large items, a shipping fee will be applied at the checkout based on the number of urinals purchased.